There are good things for health, and then there are the excellent things for health. Lemon water with honey belongs to the second category. With all the goodness of lemon and honey, this formula works miracles for our health. Lemons are a great source of vitamin C. They also have a good amount of pectin (dietary fiber), phytonutrients, vitamin B, calcium, potassium, and phosphorus. Lemons also contain a good amount of thiamin, riboflavin, pantothenic acid, iron, and magnesium. They are low in saturated fats, cholesterol, and sodium. Honey is also as good for health and has been hailed as an antibacterial food with medicinal values for thousands of years in Ayurveda. It has antibacterial and antifungal properties that help acne and wounds heal faster. It can regulate blood pressure, cure UTI, reduce inflammation, and relieve a sore throat. So, lemon water with honey together can have wondrous effects on our overall health. The concoction of lemon water and honey has been a popular weight-loss mix and the truth is—it works! There is more to lemon water with honey than just weight-loss effects. It acts as a liver purifier and consequently helps remove harmful toxins from the body. It is recommended to add raw, natural honey for optimal health. Drinking lemon water with honey every morning on empty stomach offers amazing health benefits. Here are some of the benefits of drinking lemon water with honey. Lemons are rich in pectin, a type of soluble dietary fiber that helps in digestion. It draws excess water from the digestive tract to help firm up stool. Lemon water with honey aids the liver in bile production, which is required to break down complex foods. Lemons contain vitamin C in ample amounts and is the best collagen synthesizer. Collagen is an important protein that binds and maintains good skin health. In accordance with lemon’s abilities, honey acts as a natural moisturizer that can keep the skin smooth and supple. Therefore, lemon water with honey is an excellent drink for a healthy and youthful skin complexion. Lemon water for weight loss mixed with honey has been a traditional remedy. It can help to shed some pounds, especially belly fat. Lemons are high in dietary fiber, which helps to curb hunger cravings since it slows down digestion. It acts as a detoxifier by effectively assisting the liver to release toxins from the body. The ascorbic acid (vitamin C) in lemons has anti-inflammatory properties. Honey, on the other hand, has antibacterial and antifungal properties. Therefore, lemon and honey together can boost the immune system, and make it stronger to fight the common cold and flu infections. Lemons are also rich in essential nutrients like iron, potassium, saponins, and phytonutrients that also improve immunity. Lemon water with honey is a natural diuretic that can help with UTI problems. Lemon has the ability to slightly acidify urine, and honey can inhibit bacterial growth in the urinary tract with its antibacterial properties. Thus, lemon water with honey can bring relief to distressing UTI conditions. Lemon water with honey can heal wounds faster. The antiseptic, antibacterial, and antifungal properties of lemon water and honey can speed up the healing process of wounds. Therefore, topically applying honey on cuts and burns helps in healing. Lemons are a great source of citric acid. This plays a pivotal role in the Krebs cycle, which occurs in all metabolic reactions in higher organisms like humans. Thus, lemon water with honey can help with better absorption of energy from consumed food and enhance metabolism. Lemons are acidic in natural form, but when consumed, they have an alkaline effect on the body. Therefore, they can reduce acidity, and restore our body’s normal pH balance. Drinking lemon water with honey can reduce the risk of many chronic diseases including heart diseases, diabetes, and joint inflammation that arise from too much acidity in the body. Lemon water with honey can relieve acid reflux (heartburn). The alkalinity of the drink buffers the acidity in the stomach, which normalizes the pH level of the body. Thus, it can bring relief to the esophagus or the food pipe by lowering the acidic level. Honey and lemon are good sources of potassium. This mineral is known to regulate blood pressure levels, and thus, reduce the risk of heart attacks. The anti-inflammatory properties of lemon and honey also work to reduce artery inflammation. Both lemon and honey are rich in electrolytes. Thus, a glass of lemon water with honey will keep you hydrated and energized. It is a great drink for the summer since that is when we lose most of our minerals through perspiration. To replenish essential electrolytes or minerals in a tasty and healthy way, just replace a bottle of regular water with a chilled homemade beverage made of lemon and honey. 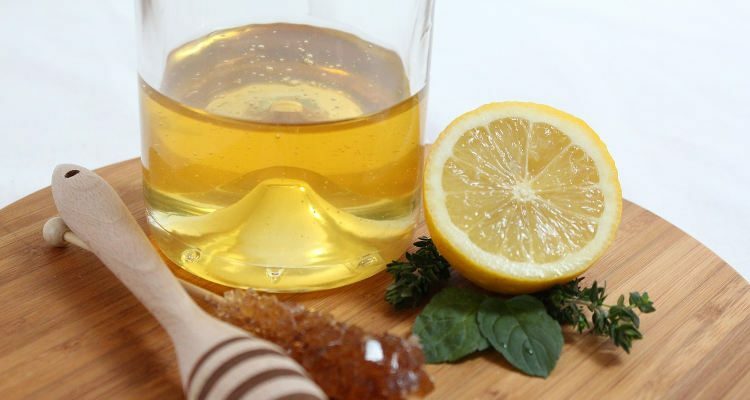 If you are looking for a natural remedy for acne treatment, then make a mixture of lemon water with honey. Ensure it has a dense consistency, and apply it topically on the acne. The antibacterial properties of lemon and honey will work wonders on the face to get rid of acne. Bouts of a cough could be really disturbing, especially if it’s a persistent one keeping you awake at night. Coughing is a way that the body responds to the environment and throat irritants. It helps expel mucus from the chest and other irritants from the respiratory system. So, in a way, coughing is beneficial to our body. But when it becomes chronic and persistent, coughing could be quite an annoying experience. An easy way to get cough relief is by drinking warm lemon water with honey. Honey has antibacterial properties that can wipe out harmful bacterial growth in the throat. It’s sweetness also helps induce mucus formation, thereby naturally soothing the throat. Lemon has vitamin C that works as an antioxidant and strengthens immunity. Both ingredients are loaded with essential nutrients that contribute to overall health that step up the healing process. Lemons contain a fair amount of vitamins A and E, as well as vitamins in the B group—thiamin, riboflavin, niacin, vitamin B6, and folate (vitamin B9). Honey contains minerals such as calcium, potassium, vitamin C, and folate. All these nutrients present in lemon and honey water work together to treat an irritated throat and cure coughs and colds. In fact, water with honey and lemon for a cough is a traditional antibiotic that works better than many over-the-counter medicines. It will not only provide relief from coughing but will also boost immunity to prevent future recurrence. As discussed earlier, a glass of freshly squeezed lemon juice and honey in warm water can offer many health benefits. The lemon water and honey combination is very popular for weight loss. It doesn’t burn fat per se, but it does mobilize the excess fat deposited in the linings of the tissue. In addition, lemon water with honey suppresses hunger by curbing cravings. Honey is excellent for obesity and lowers cholesterol as well. Therefore, drinking lemon water with honey can be beneficial in treating obesity. It aids weight loss in combination with a balanced diet and exercise. Also, since it boosts metabolism, it will help you burn calories at a faster rate when you exercise. A healthy individual weighing less than 150 pounds should drink eight to 12 ounces of water with one tablespoon of raw, natural honey and half a lemon squeezed into it. If you weigh more than 150 pounds, then drink the same amount twice a day, or 24 to 32 ounces of water with one and a half tablespoons of raw, natural honey and one whole lemon squeezed in it. Drink it throughout the morning. For best results, use lukewarm filtered water. You can drink warm lemon and honey water during cold weather to soothe an irritating throat or a cold. If you drink this first thing in the morning, it will keep you energetic throughout the day. While you can have cold or chilled lemon-honey water to keep you hydrated in summers, warm or room temperature water is always recommended. Preparing a concoction of lemon water and honey is as easy as it sounds. Yet, if you are still wondering whether to mix honey in lemon water or vice-versa, then here’s a simple recipe on how to make lemon water with honey. Pour water in a pot and place it over medium heat. Bring the water to a boil. Turn off the heat and let it cool down. Remove lemon seeds, if any, and squeeze half a lemon into the water. Stir in organic honey and combine the ingredients well. Transfer to a glass and drink warm or cold, as desired. Although lemon water with honey doesn’t have any adverse side effects, it is recommended to keep a few things in mind before drinking lemon water with honey. Do not consume lemon water if you have lemon allergies or ulcers. The citric acid in lemon can affect your tooth enamel. Therefore, if you have weak teeth, it is best not to drink lemon water regularly. Although lemon water with honey helps in detoxification, excess consumption might cause uncomfortable detoxification symptoms such as headaches, tiredness, or changes in bowel movements. Some research indicates that using honey with very hot or boiling water can be harmful, as it changes the chemical composition of honey. If you are diabetic, avoid drinking honey lemon water, or at least consult your doctor before you start.